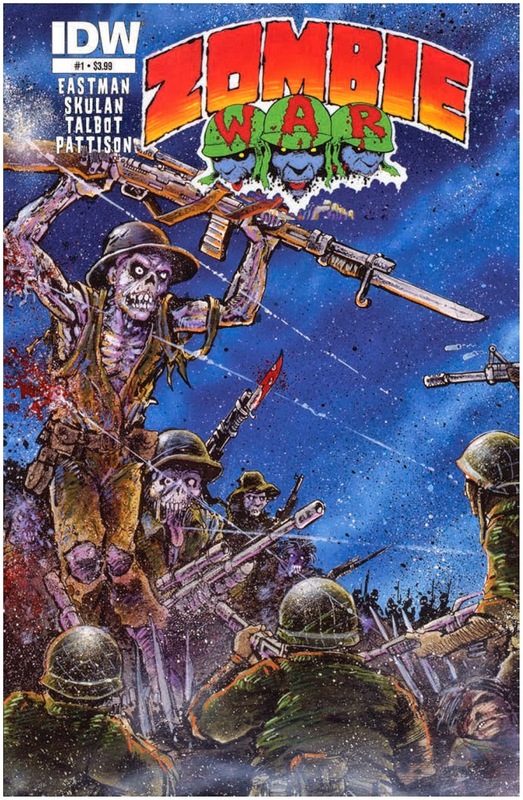 The Fellowship was fortunate enough to obtain a copy of ZOMBIE WAR #1 from IDW Publishing. The story is by Kevin Eastman and Tom Skulan, with art by Eastman and Eric Talbot, and colors by Ronda Pattison. Several UFO sightings are occurring across the United States. While this is happening, the dead are rising from the grave. However, they are assembling as an army, led by one who can think, talk and strategize! The US Air Force have been scrambled to locate the UFO, until they are called back to protect D.C. from the zombie army. Only Jina doesn’t go back, she wants to find the ship she believes is causing the current situation now happening all over the world. She is able to bring the ship down (at the cost of her own), and captures the alien responsible for the predicament. She learns the reason behind this invasion, but what can she do to stop it? Kevin Eastman’s (Teenage Mutant Ninja Turtles, Heavy Metal) involvement in this book got my attention, and I wasn’t disappointed. There are a lot of zombie stories out there, and it’s great when someone tries to do something different. That is what has happened here and I’m very interested to see how this ends. The artistic combination Eastman and Eric Talbot is great and I enjoyed it. ZOMBIE WAR #1 is in stores now, or available to order at www.IDWPublishing.com.